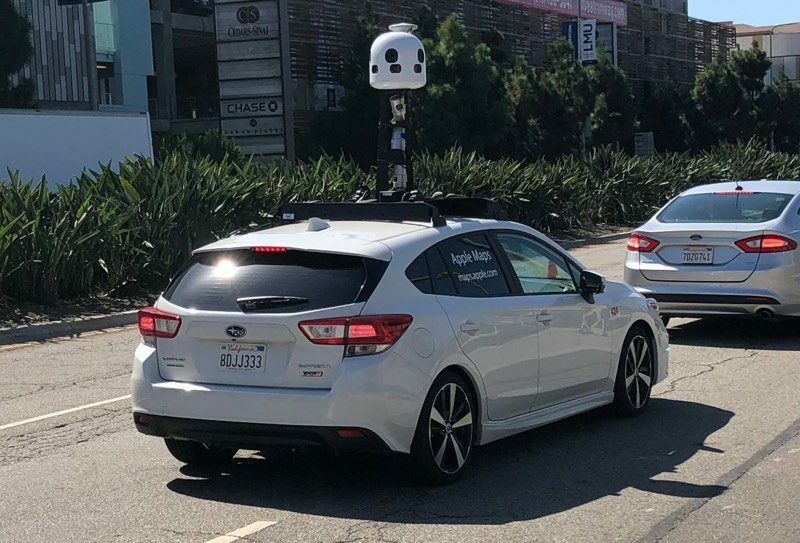 The Subarus feature new LIDAR equipment that we have not previously seen either on Apple's Maps minivans or on the Lexus SUVs that it is using to test self-driving capabilities in Northern California. Apple is using the data that it has gathered from its mapping vehicles in iOS 12, with the revamped Maps app that's been rebuilt from the ground up for better accuracy and more detail. It's not clear why Apple has switched to a new type of mapping vehicle, nor what new equipment it is using, but prior setups have included four LIDAR arrays, eight cameras, a GPS rig, a measurement tool attached to a rear wheel for precise distance tracking and image capture, and inside, a Mac Pro for storing all the data. Apple maintains a full list of all of the locations where it is gathering mapping data at any given time for "future Apple Maps updates" on its website. Here's to hoping it doesn't come into contact with a low-hanging telephone wire right as it's struck by lightning. That car would be far too conspicuous in 1985. I really like Apple Maps and I think it's improved a lot. I deleted spyware Google Maps. If Apple wanted to partner with them on an autonomous vehicle that would be amazing. And I’m assuming you use bing search engine or you’re a monumental body of knowledge? I prefer Google maps over Apple maps, but just for the sake of competition it's good for everybody that there is more than one company that will have map data as extensive as Google does. Stopped using Waze completely because it's been flaky when I need it, I chart my drive around traffic to work and home primarily using Apple Maps. Less the reliance on Google, the better. They need a web based version of their maps. Just this morning, in my car, I googled the name of a shop near my city to get directions quickly. So I obviously used G Maps as it is the default option in Google search. It couldn’t really find that place. Tried three times, thinking it was poor GPS, then switched to Apple Maps. Sure enough, it took me to destination in three turns. Had one drive by me in Minneapolis recently. Apple maps data in my city is now on par with Google maps, but I still use Google for the traffic data as that matters more here than getting the park paths and other minutia right (which is the only difference on the map data now).